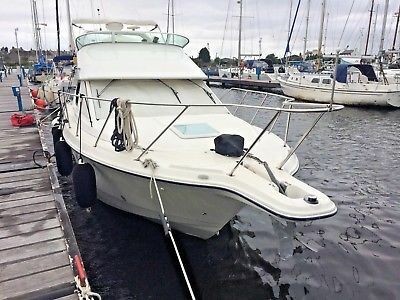 2004 Bayliner 288 Flybridge 240HP Diesel EngineBravo 2 X Outdrive System (very strong and durable)6 BerthOver the past 8 months she has been upgraded, compounded and polished and is ready for you and the family to enjoy on the sea, river or lake.I am third owner and she started life in fresh water on Loch Lomond and she is now near Lancaster in Lancashire.Please enquire about this boat, I have a long list of Inventory and she comes with circa £1000 worth of Genuine spare/service parts.She is endowed with the best possible security system, “Boat Warden” (google this name to see how this works). She also has a 4 camera CCTV system.I no longer wish to use her as my circumstances have now changed and I no longer have the time apart from the weekly visit to clean her and start engine.She comes with a 2017 and 2018 Surveyors report which provides concise evidence that she is a perfect boat which has been very well maintained and is in fantastic structural condition and ready for use. (Valued at £48,000 for Insurance purposes) Description Bow ThrusterBathing Platform3 x New 110amp/Hr BatteriesVictron Battery Management SystemHot Water clarifier to sinks and showerNew Lewmar “Pro-Fish” Anchor windlass (on remote controls from both helm stations)Full electronic navigation systems to both helm positionsFull galley inc. microwave, spirit stove, fridge/freezer, hot/cold water to sink, 240 Mains outlets throughout boat with USB sockets.Loads of storage areas.Full Control panel for whole boat.Grey/Black water holding tank with Macerator.New Total cover Cockpit canopy on S/S Frame (just use with all curtains removed if you wish)Flybridge cover with Bird ScarerI am sure there is lots more even apart from the usual fenders, mooring lines and boat hook so, please contact me to get the up to date list. I was on her today and noticed the hours counter move over to record her 244 hour of use. Yes, she has been more used as an expensive picnic table than out on the ocean wave but, she has served us well on both counts. I have more pictures and can take more specific pictures should you wish to see prior to viewing her. I am realistic and have taken advise from 3 separate and independent boat brokers who have advised a price of between £39950 and £48000.I work for the RNLI and have a great respect for the sea and thus make sure my boat is in tip top condition with NO issues that can upset my enjoyment of her. Hence, she has never wanted for anything. We have links to a very professional boat haulier who has suggested that he can deliver the boat to any UK or European destination for a very favourable price. I have used his services over the years and he has NEVER let us down. Good luck, You will not be disappointed. ImportantShe is advertised elsewhere and I reserve the right to cancel this ad should we secure a sale in any one of the other adverts. She is not currently with a broker but, should we decide to commission a broker to sell her, we will, undoubtably, have to raise the ask price to accommodate their fees. So, grab yourself a bargain while you can. If you are lucky enough to buy her, I will expect prompt payment through BACS and, until the funds have been acknowledged by my bank, the boat stays with me.